When it comes to a product made using 100% recycled materials, the Earthlog Scented Fireplace logs is about as Green as is gets. In fact, this earth-friendly fire log is such a good idea, thousands of businesses and residents from Huntington Beach, California willingly recycle their mail into a product that's coming to the Shark Tank Show. The Earthlog's invented by Tom Sanetti will be appearing on Shark Tank Episode this Friday night, November 21, 2014. Tom has a very interesting success story starting with a pile of junk mail that's led him all the way into the Shark Tank in rather quick fashion. Starting in his kitchen shredding and cooking-up a little mail with some candle wax, soon mushroomed into a 10,000 square foot state of the art facility within a few short years. 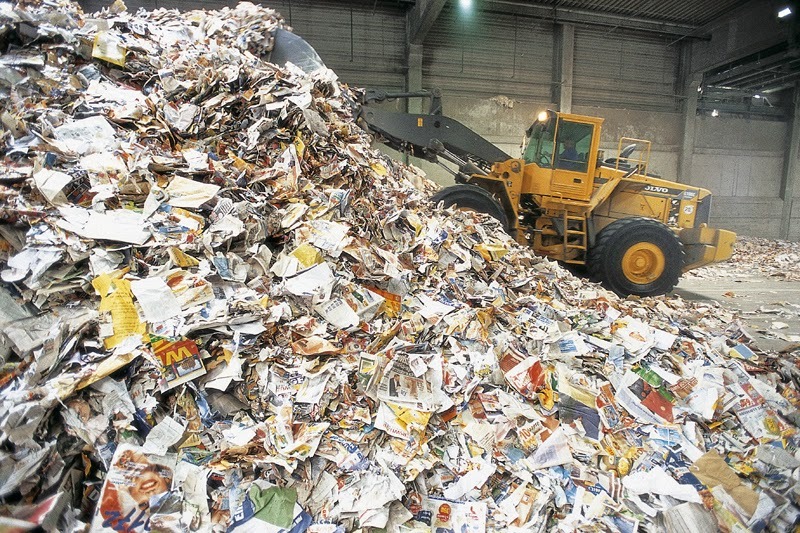 If a picture's worth a thousand words, then this picture of Earth Logs recycling faculty speaks volumes when it comes to the volume of paper material this business is recycling. To make it easy keeping this paper material out of the landfill, EarthLogs has also created a scheduled pickup service which guarantees all your mail will be shredded and recycled into a new scented log. The Earthlog's although similar to other artificial fire logs is the only premium scented 100% Green Fire Log on the market. The site claims the Earthlog burns up to 80% cleaner and produces more heat per pound when compared to firewood. Unfortunately, it doesn't say what type of firewood they're comparing the Firelog to which would greatly influence the tests outcome. Coming from someone that's familiar with BTU's of different types of firewood, this was the first thing I looked for but couldn't find anywhere on the site. If you happen to read this Tom, maybe you can elaborate more on the test. Considering the Earth Logs is made with 100% recycled paper and candle wax, I'd imagine the BTU factor would be considerably high and make another "great" selling point compared to the competition. In addition to the scented firelog's, EarthLog has also invented the Citronella Fire Log guaranteed to keep mosquito's away for hours at a time. This product is also made using 100% recycled materials and uses a natural non-toxic citronella oil that's also environmentally friendly for the earth. Taking any waste product that's filling up our landfills and making a viable product is always a good thing in my book. The biggest problem is inventing in a product that could make a "BIG" difference as far as the volume of material being consumed. I still can't get over the picture of Earth Logs recycling center above, which looks like a few transfer stations I dropped off trash at in the past. As Robert Herjevic would say, "That's Amazing." I'm sure a lot of people would buy the Earthlog's because the entire product including the packaging is all made from recycled materials, but when you also have a superior product, everyone will be interested. Having the choice of different scents when burning these fire logs is a great motivator to purchase compared to the competitions. The Citronella Fire Log's that repel mosquitos will also be a huge seller in any mosquito infested area. In this Shark Tank Episode 612, Nick Woodman, the inventor of the GoPro Camera, will be making his debut as the newest Guest Shark. As a general rule that's batting a perfect 1000 to my knowledge, all Guest Sharks have invested in at least one product during their appearance. I might be going out on a limb here, but from everything I've learned about Earthlog's owner Tom Sanetti and Nick Woodman's 1st Shark Tank appearance, this looks like a winning combination. I wouldn't be surprised if another Shark or two also invested into Earth Logs with Woodman. Great idea and eco friendly.